Put the sun to work for you today!! 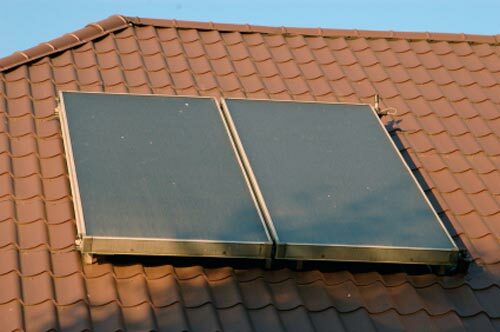 Solar water heating is the least expensive and most efficient use of the sun’s energy. Systems are designed to be easily installed by professional installers and provide many years of trouble-free service. Payback periods are very short (usually 3-5 years). Systems installed in 1979 are still operational today. Ask us for details or to talk with our long term customers. Federal tax credits can reduce the cost of an installation by 30%. A properly designed solar hot water system will provide most of the hot water usage for a homeowner, with very little backup needed from the local utility system. We use only top of the line American made solar collectors and water storage tanks. Our Solar water heater systems are designed with quality components and they are installed to be an attractive addition to your home, NOT A SCIENCE PROJECT. You will not find your roof looking cluttered. The aesthetics of the installation are as important to us as they are to you. We offer as an option one of the highest quality state-of-the-art solar hot water monitoring system, enabling you to get real time information from any computer or smart phone showing the complete operation of your solar hot water system and its btu production. We also monitor your system and alert you and our service department if anything is amiss. Don’t forget to ask about finance options on a new solar water heater. Call for a free INHOME Consultation today! It’s time to put the sun to work for you!